Aisha Heredia was born in Quezon City, Philippines, and raised as a child of the Pacific between California, Hawai‘i and the Philippines. As a proud, first-generation immigrant, Aisha’s parents brought her family here because they knew we would have better educational opportunities. 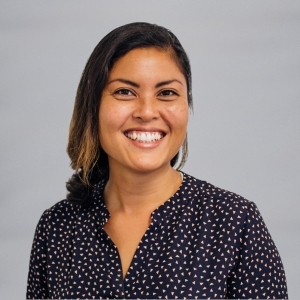 She has been in the educational field for over 15 years; starting as an after-school teacher, then an in-class teacher, a business administrator for a public charter school, a training consultant for the Hawai‘i Home Visiting Network and now as the community and outreach manager with HawaiiKidsCAN. Aisha received her BA from UC Berkeley in Development Studies with a minor in Education. In her role, Aisha wants every family to feel that regardless of where they live and how much their family makes, their keiki can have access to the best opportunities and go to an innovative, high-quality school. Aisha lives in Manoa, enjoys community beach clean-ups and permaculture-gardening meet ups. She is also a birth doula. My grandmother, Mama “Che” Ilar. She was an indigenous healer from the province of Bikol, Philippines. When the United States opened the first Western hospital in the region, the community saw her as the most knowledgeable midwife. She birthed entire communities through home birth practices. No one trusted going to the hospital to give birth, so the hospital recruited her to be their midwife. Mama knew she could teach the hospital about seeing community and health holistically, and she knew that there was something very different she could learn from them. She became the first registered nurse from Bikol and still carried her knowledge of healing plants and connection to spirit with her. When I was sick she would give me teas from plants that she grew in our yard. She was my first medicine—and my first teacher. I’m still learning from her to this day. When I wake up in the morning I’m excited that what I do can make a positive difference for people. I’m an advocate, sister, auntie and consumer of public education. I want to see high-quality educational opportunities available to everyone. I went to public schools my whole life. When I have kids I hope they go to an amazing public charter school. The public education system has obstacles, but it also has passionate people working as teachers, counselors, principals and parents who care about how to make schools better. There is so much potential for innovation, learning from roots culture and creativity in our schools. In indigenous societies, the whole community is part of the learning experience. This is what we should emulate in our school communities: that we can learn from each other in and outside of the classroom. It is an exciting time to be an educator, I like to see this bridge of innovation and community-centered learning and be at the forefront of these educational changes.